"Customers love press parts, but hate press dies. " Therefore, we create the technology of "Dieless" forming. 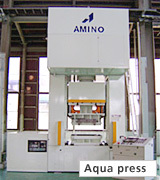 Use of Aqua Forming Process has reduced the steps in forming and the number of dies to be used. Use of Dolomite forming has enabled forming of parts as sets, thus reduced the number of dies to be used. 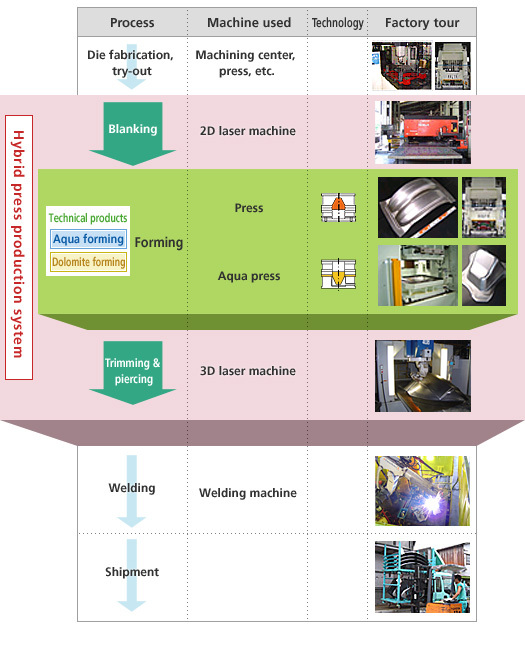 *A method to form multiple kinds of press parts as a set with a single die. *It enables forming of parts in the same complex' realizing one-piece-at-a-time production. The Dolomites centered around Cortina d'Ampezzo in northern Italy are a world-famous ski area, consisting of odd-shaped mountains (See the photo on the left). Since the shape of the parts formed as a set is like that of the Dolomites' this forming method was named Dolomite forming method. Dies other than the press forming dies are not necessary! Making proposals for total logistic cost reduction by set delivery, sequential delivery, etc. Tunnel lighting equipment, road lighting equipment, projectors, etc.